There is a special place in New Zealand. Some might call it claustrophobic, some might say pitch black. I name it "gorgeous". 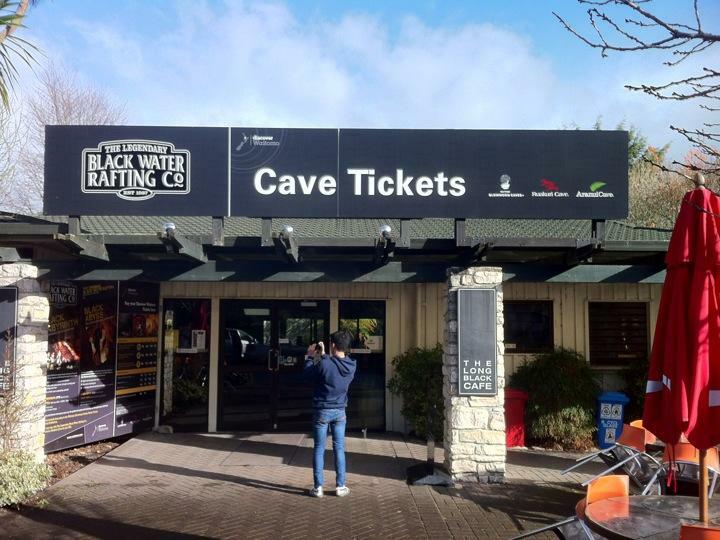 The place I'm talking about is the Waitomo caves, an enormous underground complex, dug out in limestone thanks to the undue amount of precipitation, inhabited by a feral tribe of creatures. The natives of the cave are, in the words of our guide: "cannibalistic, promiscuous worms with sun shining out of their arse". What I am talking about is of course the glow worms of Waitomo. The entire ceiling is spotted with brightly shining, blue-tinted dots, advertising the presence of a glow worm. The reason they are glowing is because they have no other way of taking a crap... They literally burn their crap inside themselves which also serve the purpose of luring in any nearby insects 'til they get caught in the threads hanging down, in essential the body of the glow worm. So in order to see them you have to get down in the caves, which is quite an adventure in itself. First you rappel down almost 40 meters of thin air, through a narrow throat of a cave entrance, expanding into a massive vault. Just a short walk in, what would be pitch black if not for the head torches on everyone, and then you flick the lights, bathing the cave in darkness, and with no visual stimulation they throw you down a zip line. Imagine just clicking on two carbines and then taking a leap into thin air and suddenly wizzing down at breakneck speed with absolutely no control or idea of what lies ahead, further than your arms stretch. The last part was optional, either taking a nice and dry walk up, through a long and gently sloping corridor OR... Clawing your way up a torrent of water gushing down in your face. Waterfall sounds fine to me. The guide in turn informed me that I was supposed to go into the next cave and keep to the right wall. Ok, easy enough. Walks into the adjacent cave: dead end... Uhm, what way was they again? "No, it's just down there" he says. I crouch down, hoping dearly that it does not involve holding your breath underwater to get through. I'm in luck, all you have to do is pull your belly in tight, but your head remains safely above the surface albeit your head being the only part above the icy waters. This is when the really scary part comes, a waterfall, spewing a continuous stream of water-whipped-white right where they tell me I'm meant to climb... Well f*** it, no guts no glory. It is actually surprisingly easy traversing the stream thanks to the clear grips limestone provides when cleared by water. Then like 30 meters later there is another even more savage looking waterfall, but this one also proves manageable with careful footing. After that we actually see the sun again, for the first time in 3-4 hours, and the adventure is over. Really damn cool, totally worth it and all I want is more, but I've got a bus to Auckland to catch so it'll have to be another time.